Oh, Donny. Where to begin...where do. we. begin? Hair, I guess. Donald Trump's hair is the most controversial thing about his look. Or is it the tan? Oh, gosh this is hard, but we'll start with the hair. Donald tries to mask his balding with long combovers, thickening gel, and also dyes the gray away. It's not effective. Have you seen the flyaway videos? Flyaways are real people! My suggestion to Trump, not that I would ever offer one, would be to embrace the balding with shorter hair - a tighter cut. Sometimes long strands over a balding scalp actually exacerbate the problem. I feel The Donald's pain on this one as I've been losing my hair for years. Minoxidil and The Ordinary's Hair Density Serum have slowed it down, but not totally stopped it in its tracks. I'm considering trying PRP (Platelette Rich Plasma) treatments - a vampire facial for the scalp in the coming year or two. Hair transplants are VERY expensive. There have been several promising studies that seem to indicate a cure for pattern baldness could be on the near horizon. Fingers crossed! Otherwise, I'm going to rock a full bald head. Embracing what you got is often the sexier route! Here are 50 hairstyles recommended for men with balding. 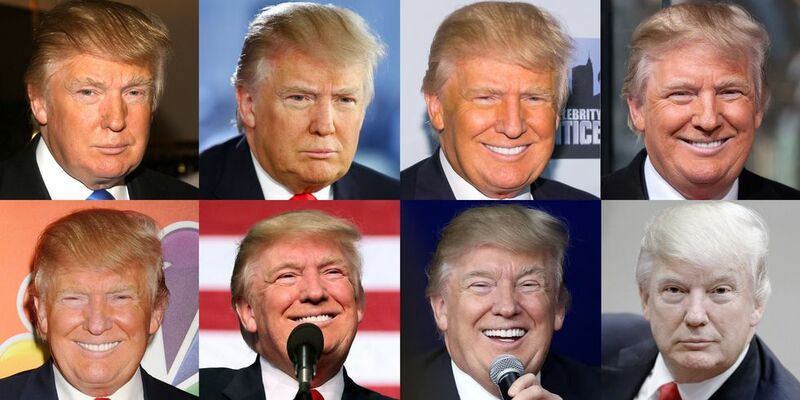 Donald's iconic tan...well, orange skin, has to be where we focus next. How someone could fail so miserably at creating a healthy looking glow for so many years defies logic, especially when their wife is Melania Trump, who clearly knows a thing or two about beauty. Did you know she was about to launch her own skincare line before Donald was elected? But, as we know, he rarely listens to anyone's advice, especially his wife's - otherwise he might not be such a cyber bully, eh? Tanning experts and historians, yes, there are tanning historians, have a lot to say about Don's skin. Omarosa claimed he has tanning beds in his homes that he uses daily, and one tanning expert said the white rings around his eyes are evidence that he uses goggles during these tanning sessions. Others have, of course, noted that bad spray tans and the wrong shade of bronzer in combination with strong lighting have often produced a very orange look. According to Mother Jones, "For nearly 20 years, Trump has had a close personal and business relationship with an Indiana businessman named Steve Hilbert, who in 2006 became CEO of New Sunshine, a maker of tanning beds, spray booths, and Kardashian-branded tanning lotions and bronzers." But, good news: MarieClare has noticed the orange tan is fading! Surprisingly, given his vanity, there's not a lot of evidence of surgeries or injectables or even any good skin care going on for the Trumpster, so, we'll have to move on to fashion. Like his orange skin, there are countless think pieces on Trump's fashion. Ezra Paul dove into why Trump's suits are so frumpy. Much like his fading tan, those who pay attention to these things have noticed that Donald's suits have begun to fit more appropriately. For years his suits were baggy, frumpy, too long in the arms, and just overall yuck. An ill-fitting suit can make your body's proportion's look odd and it seems Trump has finally caught on. That tiny hands thing might have been in part to suit arms of the wrong length and width. Here's how you can look sharp while wearing a suit, if wearing suits is your kinda thing - it's definitely not mine! At Weird for Beauty we don't care how large or small you are or how much hair you have. We just want you to look and feel your own personal version of your best. One final thing to know about Trump is that his diet is extremely heavy on fast food and Diet Coke. This kind of diet isn't just bad for your heart and overall health but it can cause breakouts and bad skin as well. Diet soda in particular is known to cause skin issues. Stick to water! Thank you for visiting Weird for Beauty! Please be sure to follow us on the socials!